Today was an exciting day in the Promo world – The first trade show of the year, hosted by ASI, in Orlando, FL. 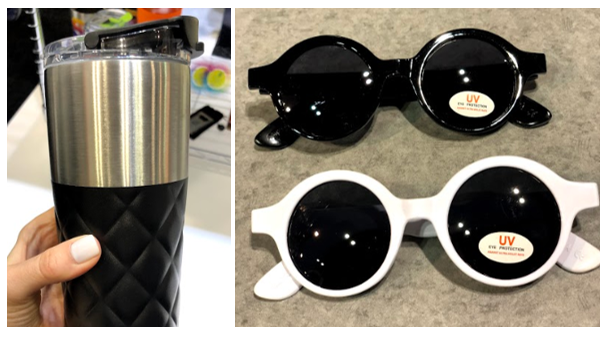 We walked the aisles to scout out the hottest and newest promotional product trends to bring back so you can be the first to deliver these gems to your clients. The early bird gets the worm, after all. Here’s a first look; Trust us, you won’t want to miss this. Colors like gold, silver, iridescent and rose-gold made a widespread appearance this year. 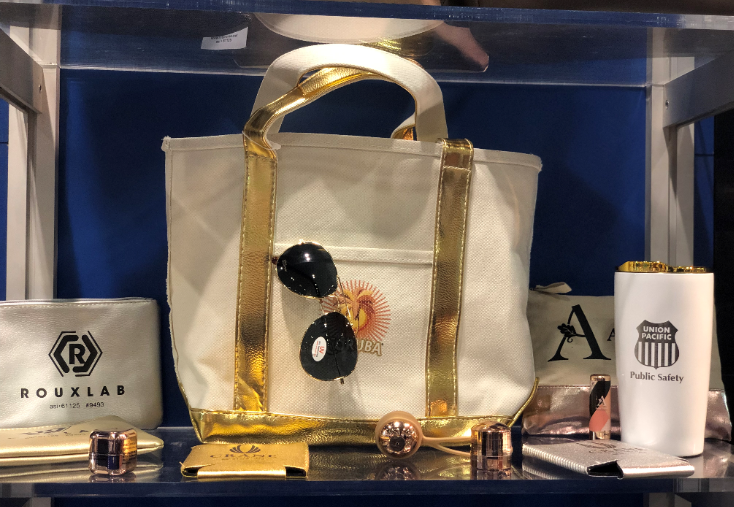 These items, with their Hollywood-inspired brilliance, were seen on metallic trimmed totes, lip-balm, Koozies® and drinkware. Also notable within this category were upscale-looking pieces such as these sunglasses and quilted tumbler. Safety has been, and should always be, a priority, but safety items are rarely top of mind when selecting a corporate gift. 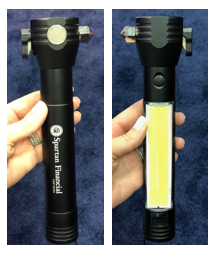 This flashlight is something that anyone who drives a car should have, therefore making it not only a useful gift, but one that will be remembered for years to come. Equipped with a flashlight, magnet, glass breaker and seat-belt cutter, this potential life-saving item can be stored in a dashboard for easy access in case of an emergency. Also topping the charts – reflective gear in all shapes and sizes. 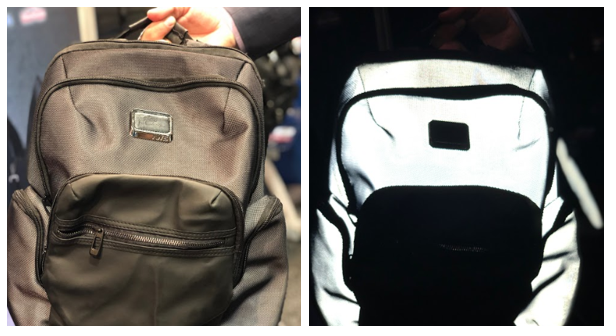 We love this backpack – shown below is what it looks like in daytime (on the left) and night-time (on the right). Introduced in 2018, the wireless charge trend is far from over. Our favorite must-have item? This 2-in-1 wireless charging portfolio, a fantastic choice for financial companies, lawyers and tech conferences, just to name a few. Why do we love it so much? 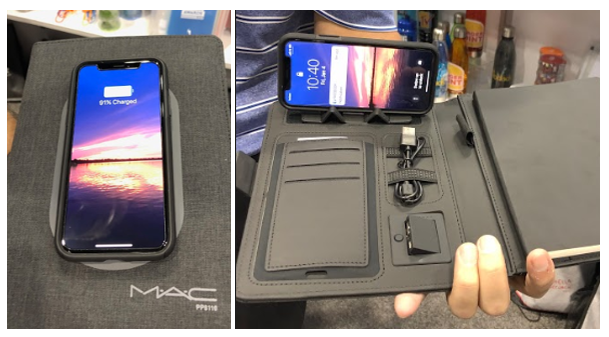 Among other features, it comes with a built-in phone stand and a USB dock to cater to those recipients whose phones are not wireless charge compatible. Also tied into “Cause Marketing” is the idea of people choosing to invest in products or businesses that give back in some way. 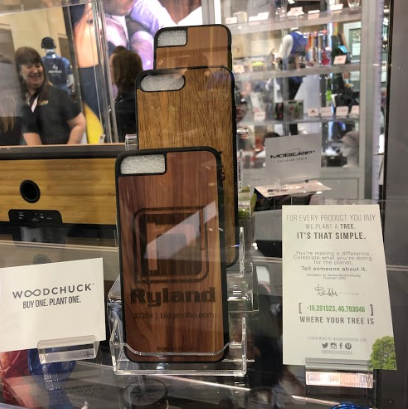 Social responsibility matters to people, and we’re thrilled this phenomenon has extended to the promotional products world. Last year, we introduced you to Basecamp® , a leading outdoor brand supported by Dan Nevins. This year, we’re inspired by a company called Woodchuck® who offer USA-made items made of Cedar, Walnut or Mahogany. Woodchuck plants a tree each time an order is placed. Not impressed? Wait until you receive your order. A custom code will be included on a card which allows you to track your exact tree. Still consider promotional products to be cheap swag? Think again. 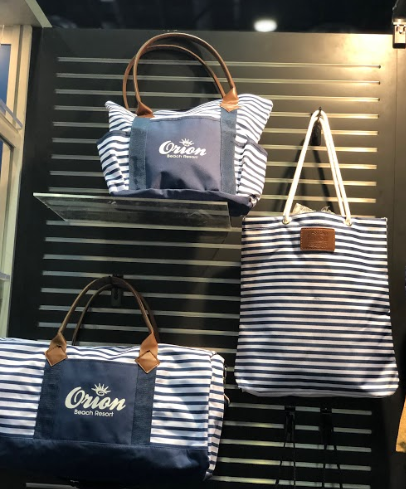 These beach resort-like bags have us swooning, and there’s ALOT more where this is coming from (at a fraction of the price of buying these beauties retail). The main takeaway? Don’t settle for the items you’ve ordered time and time again. 2019 is all about touting branded promos that look as if they came off the shelf of your favorite retailer. Custom folding chairs, cooler bags, fleece blankets, and camping accessories are all the hype this year, many in deep rich colors and Tartan and Gingham patterns. Our top outside-the-box picks? The first, this 64 oz. 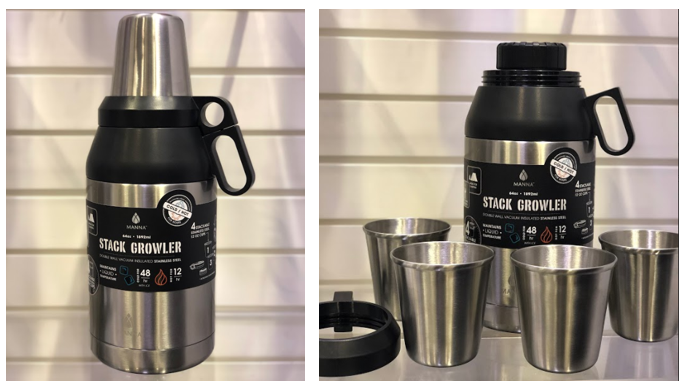 Manna® Stack Growler, which comes with 4 stainless steel cups and keeps liquids cold for 24 hours and hot for 12 hours. It basically screams “Go plan a camping trip (and don’t forget the soup!)”. The second item that caught our attention was this fold-able solar power charger. Any tech-lover or tech-addict (Nomophobia, anyone?) will appreciate this giveaway, as it uses the sun to charge your clients (many) devices. Encourage them to keep one in their car, another in their luggage, and one at home (just in case the power goes out!). Modern textures, colors, wood-tones and marbles are – literally – everywhere (and we’re loving it). Consider adding a product with a high-end look and feel to your marketing mix this year. There you have it, folks! 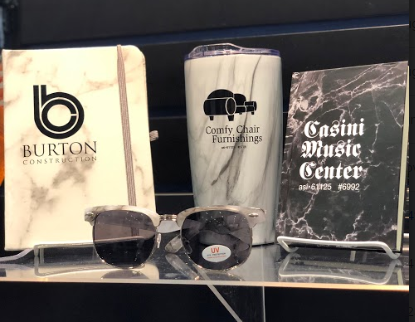 A fresh look at some of the hottest promotional product trends for 2019. Love these items and can’t wait to have them? Get in touch. We’re proud to be your trusted partner for all things promo. Stay tuned for takeaways from our next big show, the PPAI Expo, in Las Vegas later this month. Don’t forget to follow us on Facebook, Instagram, Twitter, LinkedIn and Pinterest to get daily updates of all things trending!